Born in Summerside on Prince Edward Island, George Matheson moved to Vancouver at a young age and was one of the lacrosse-playing Matheson brothers who learnt their trade at the Cambie Street recreational ground under the watchful eye of Al Larwell. By the time he retired as a player in October 1918 at the age of 39, he had 21 years of the game under his belt – during which he learnt to play every position. Starting out as a goalkeeper when he was young, he moved to the defence for a couple of years before he developed into a solid, defensive-minded midfielder and became regarded as one of the best players developed on the Pacific Coast as well as one of the fastest. 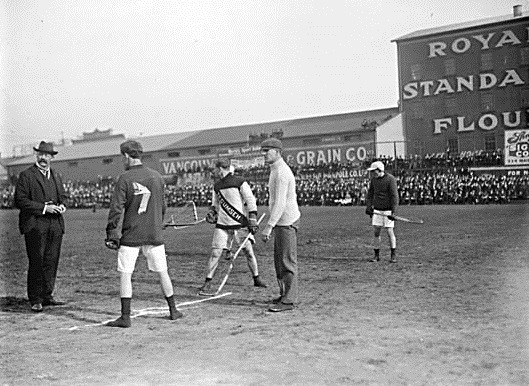 Vancouver Lacrosse Club and Toronto Tecumsehs face off in Minto Cup action at Recreation Park in the autumn of 1911. The player wearing #7 taking the draw is most likely Vancouver centreman George Matheson. 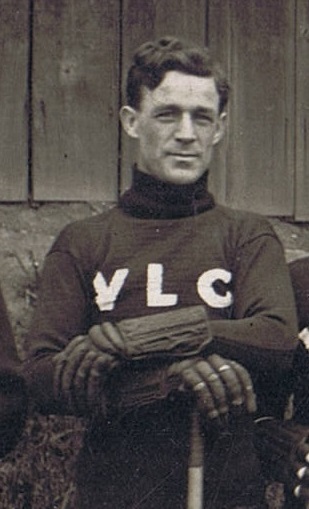 Matheson played 7 seasons as a pro with the Vancouver clubs between 1909 and 1914 followed by a comeback season of sorts in 1918 with Vancouver Greenshirts of the Mainland Lacrosse Association. During the 1910 season, George Matheson was one of a group of four local players (along with goalkeeper Dave Gibbons, Ernie Murray, and ‘Toots’ Clarkson) who quit the team in early June after they went to Con Jones with demands for more money. Eastern imports Johnny Howard, ‘Bones’ Allen, Harry Griffith, and Harry Pickering were all rumoured to be receiving $50 per week while the four upshots ‘held up Jones’ for more pay because they were only getting half that amount per week – but felt they were doing the lion’s share of the hard while the imports reaped all the benefits. Despite the hold-outs having a lot of sympathy from the local fans, Jones refused their demand of $40 per week. Gibbons, Murray, and Clarkson then bolted the team for the rest of the season while Matheson eventually re-joined the team in August. Ernie Murray would sign with cross-town rivals New Westminster in 1911. In mid-June 1913, out of frustration and disgust with how poorly his team was performing, Con Jones released Matheson from the Vancouver Lacrosse Club roster along with veteran team-mate Archie Adamson. The change wouldn’t help Jones, as one month later the league had run aground and suspended operations due to unresolved scheduling disputes. 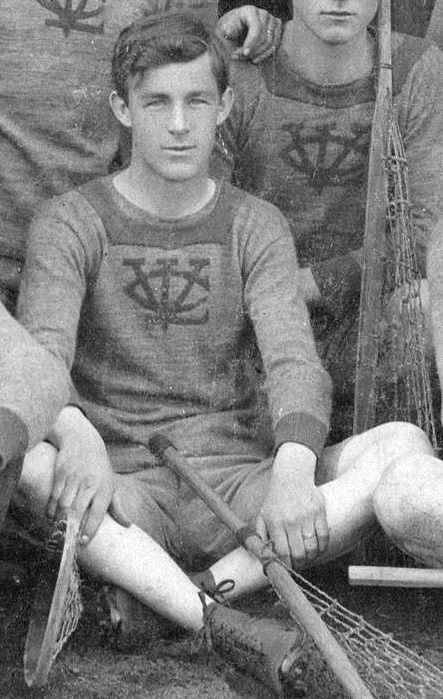 In an ironic twist, George Matheson would then find himself playing for the Vancouver Athletic Club when they challenged New Westminster for the Minto Cup in the autumn of that year. George won two Minto Cups, in 1911 and 1918 – although the 1918 championship for Vancouver was quickly declared null and void the following season when New Westminster claimed surreptitiously and after the fact that their club did not actually compete in 1918, after losing the eight-game series. George Matheson used this whistle while refereeing games in the 1920s. By the time he started playing in the pro game, Matheson was a home (offensive) midfielder, then moved to centreman in 1911, and then back to a more defensive position on the midfield midway through the following season. Matheson played in 58 pro games and scored 15 goals. He was a remarkably clean defensive player for the time, with only 6 penalties and 25 PIM to his name. After his retirement, he continued his association with the game as a referee – having experience with the whistle going as far back as 1905 when he would call intermediate games. George Matheson passed away in 1961. Four years later, he was named as a charter inductee to the Canadian Lacrosse Hall of Fame in 1965.